PhD researcher in Human Geography from “University of São Paulo”, São Paulo, Brazil. Undergraduate in History from the "UniSant'Anna", São Paulo, Brazil (2006), Graduate in Policy and International Relations from the "Foundation School of Sociology and Politics" São Paulo, Brazil (2008), and Master in Human Geography from the “University of São Paulo” São Paulo, Brazil (2012). Visitor Researcher in Virginia Commonwealth University (USA) and Honorary Researcher in The University of Hong Kong (China). Fellowship by FAPESP (São Paulo Research Foundation). In general the literature regarding terrorism and organized crime normally identifies the differences between these groups when political and/or ideological issue is involved. Its basic assumption normally assume whereas terrorist and organized criminals share similar attributes in their organizational structure and cross their financial interests by buying and selling services and goods from each other, their differences would reside in the means and ends. However, it is more correct to say the decision of whether an organization is a terrorist group is only based on whether the political demands of the group colliding or converging with the state’s interests. The endless discussion about what defines an organization as a terrorist organisation is relevant not only in academia but also in public administration and law. While the idea of terrorism as a tactic is much easier to achieve because every political actor can use such means, some authors have been trying to push the delimitation or definition of what would be a terrorist actor because such is missing from the literature. In contrast, other authors have, in the opposite direction, argued that there are already too many concepts, and the only problem left is that consensus is never achieved.. In fact, the problem regarding technical approaches to understanding terrorist groups and their structures is that the comparative analysis methodology often applies factors relevant to organized crime, since every aspect of one type of irregular group may be found in another. Even the common belief that criminal groups do not involve themselves in ideology, culture or religion may have exceptions that frustrate pragmatic discussions. It is not difficult for any researcher to find many sources trying to define terrorism, either under legal definitions, which largely vary among different specialists and countries, or based on the sociological aspects of terrorism that consume great amounts of debate time among academics. The search for a definition of terrorism has a very long history, but the 1945 conference in San Francisco deserves a special attention because the Philippines and Bolivia tried to define the concept of “aggression” in the text of the United Nations Charter by proposing the inclusion of “supplying arms, ammunition, money or other forms of aid to any armed band, faction or group” as a form of interference in internal affairs. However, this approach was suppressed by the Soviet Union. The reason for the Soviet Union’s action was probably that an empty definition of aggression could eventually help the “socialist system”, which was counting on internal factors of revolutionary situations to expand the socialist model, leaving the socialist states free to openly speak against eventual repressions and give active support to revolutionary movements (Romaniecki 1974). It was only after the terrorist attacks of 11 September 2001 in New York and Washington (even though prior to this event such acts were already technically defined as terrorism) that the discussion really began to attract major attention from lawyers and academics, becoming part of mainstream research and political discussions, not only in the United States but in almost every part of the world. To Dedeoglu (2003), terrorism in general is the manifestation of local versus global issues. In addition, the problem is not exactly in defining terrorism, which is an act, but in defining terrorist, who is a subject of law. The European Convention, for example, considers the acts of one individual against another to be terrorism; however, it does not clarify the organizational aspect of terrorism. After the attacks of 9/11, the United Nations Security Council approved motions condemning terrorism and delimiting the fight against it, and it also created a list of organizations and individuals related to terrorism without establishing any definition. Those resolutions in general targeted top Taliban associates and people from the Middle East living in other countries, making it clear that the specific targets were 12 organizations embedded in a much bigger universe of international terrorism, which was composed of more than 300 organizations, some of which were more dangerous than the 12 selected groups. In fact, according to Dedeoglu him, this consensus in the UN on the fight against terrorism made it possible for a state to legitimize their list of organizations to be targeted. This problem not only is found in formal international diplomacy and conventions but also has been an issue plaguing academics for decades. In fact, the attempts to define terrorism are largely in the academic literature. According to Meisels (2009), some social scientists have developed dozens or even hundreds different definitions, causing an overuse of the word “terrorism”. For Meisels, the reason for such variance lies in the different objectives being sought in the definition. For legal experts, the definition aims at prosecutions and penalties against terrorists, while for social scientists, the objective is description and understanding. Authorities, in turn, will choose the definition that is most convenient for their own interests against irregular actors that may challenge their legitimacy, especially because even the state can commit terrorist acts eventually. This case regarding state behaviour is also made by Zanchetta (2016), who describes Operation Condor as a form of state-sponsored terrorism conducted by South American countries with support from the United States during the Cold War, using terrorist techniques to fight internal enemies and groups considered dangerous and subversive, which were mostly connected to communism. The actions developed by the governmental agents were technically true terrorist actions, such as international assassinations and kidnappings. It is possible to observe this mutable and fluid characteristic of the definitions of terrorism, and in general, the definition may change according to temporal contexts. Furthermore, it is interesting to observe the problems of definition and delimitation of terrorism by comparing and contrasting, for example, the United States and Brazil. In the United States, several law enforcement agencies may have different approaches towards the delimitation of terrorism. The concept itself was developed over a number of years, but the basic concept of terrorism was established in the Immigration and Nationality Act of 1952. It was only during at the 1990s that attention was drawn towards developing a serious definition, and in particular, after the bombing of the Oklahoma Federal Building in 1995 and obviously with increasing urgency after 9/11 (Dedeogu 2003). Also, according to Freilich et al. (2009), the perception of what constitutes the greatest terrorism threat to United States is in fact dynamic and may change over time; different surveys may eventually consider anti-abortion activists to be the greatest threat, while more recently, it may be Islamic jihadists. In Brazil, on the other end of the spectrum, there existed no legal definition of terrorism prior to 2016 (law nº 13.260). This law was created after pressure from international security agencies because the Olympics were being held in Rio de Janeiro in the same year, and only after strong protests due to concerns that such definition would be too broad and would eventually lead to social movements and NGOs being considered terrorist groups when making political demands in public marches or protests. Ramsay (2015) goes to another direction, exposing two main schools of thought regarding the concept of terrorism. While one school consists of the idea that creating a concept would be unhelpful and should be abandoned because terrorism is a social construct, the other is based on the idea that defining terrorism has more to do with inconsistencies and double-standards than really defining the term. Ramsay also states that terrorism already has a definition, even without an academic consensus, and the supposed lack of a definition has been exaggerated. Therefore, the problem is not to identify what is terrorism, but rather how and when to consider a group to be terrorists. Among the reasons for disagreement on this subject, the most important is probably the fact that what is a terrorist group to some is a freedom fighting organization to others. Ramsay also discusses whether irregular and clandestine groups that normally do not use violence should also be considered terrorists. A similar line of thought was expressed by Khan (1987); “… a political disorder at the core of which lies an aggrieved group”, and “Although the article does not suggest that the political demands of all aggrieved groups are necessarily legitimate, the members of all aggrieved groups do share the perception that they have been wronged and that their grievances have been ignored”. Those aggrieved groups (or irregular groups) will get involved with two types of states, supportive states, which will give some kind of aid to those groups, and suppressive states, which will fight against these groups. In the end, the decision on whether to consider each group to be either a legitimate group or a terrorist group will be in the hands of each government and will be based on the confluence of interests and objectives shared by the aggrieved group and the state. For example, whereas the Soviet Union during the Cold War viewed Palestinian violence as legitimate, it considered the Afghan resistance to be terrorists. Whereas the United States in the 1980s described the Afghan warriors as legitimate resistance fighters, the US condemned the Palestinian resistance (a situation similar to what is currently occurring in the Syrian War). The decision of whether an organization is a terrorist group is based on whether the political demands of the group collide or converge with the state’s interests. This notion, exposed by Khan, is neutral and more realistic than most definitions because it considers the political interests behind the label of terrorism. Of course, civilian casualties may be awkward for the states that support these organizations; however, there are many cases of states ignoring those kinds of events if their interests or needs are high enough. While the methodology to define a group as a terrorist group is problematic, controversial and unclear because it involves political, moral and legal aspects. The discussions to define the concept of organized crime could only be described as controversial due to disagreements among the academics in an attempt to reach consensus. For some time, academics such as Duggan (1989) argued that there was a possibility that the Mafia was only a fantasy, an invention of politicians to explain their failures, or even an invention of Mussolini’s to punish political enemies. However, today, the literature no longer ignores the Mafia’s existence, and normally, no one denies it. When scientists explore terrorism and organized crime, they normally identify differences between these groups only in the political and/or ideological realms, considering that the structures, organizations and modi operandi may be very similar in most cases. In fact, criminal groups can even use terrorist tactics, but the boundary is formed by the involvement of ideology and politics. According to Albanese (2007), whereas organized crime aims for profit or corruption, terrorist groups aim for political objectives. However, he also considered that eventually both types may cross paths and make deals; terrorists need criminal activity to fund their fights. To Abadinsky (2010), terrorists and organized criminal groups share many attributes in their structure and intersecting financial interests; terrorists and criminal organizations need to buy goods from each other, for example. It is generally agreed that the main differences between these groups reside in the means and ends of both types of irregular groups. While terrorist organizations would use their funds for political goals, the organized crime organization would seek to form a parallel government and at the same time coexist with the current one. In the end, Albanese established a comprehensive definition of organized crime as a continuing criminal enterprise working rationally and aiming for profits from illicit activities, and such continuity is based on the use of force, threats, monopoly control and corruption of public officials. However, even the most accepted characteristic, the hierarchical structure, is also a problem since some authors, such as Albini, et al. (2012), have established that organized crime can also be based on loose relationship structures and not a rigid hierarchical organization. Based on my own personal experience during interviews and field observations in Hong Kong, Brazil, Paraguay and the United States, both arguments are true to some extent. The structure of an organized crime faction will behave according to the environment in which it exists and may adapt to environmental changes. Those groups will have a pyramidal structure when the law and its enforcement may be weak and there is social and political intolerance for criminal acts, normally following a high level of corruption. However, criminal groups may become flatter organizations when the political and social systems are efficient and can avoid those problems. The criminal structure will adapt to survive in the environment where it is inserted. Other attempts to separate terrorism from organized crime are examples of epic failures, such as the lecture on “Terrorism and Crime: Their Similarities, Differences, and Lessons Learned” (2012). This demonstrated that the basic differences between organized crime and terrorism are the following aspects: terrorism is not a specific offense; terrorism crosses jurisdictional boundaries; terrorists seek public recognition; terrorists operate towards a broader goal; terrorists are “altruists”; terrorists innovate; and terrorists mostly operate in dynamic groups. The problems related to this presentation are enormous, especially because all those “differences” are in fact found in both groups. Organized crime, in many cases, is not considered a specific offense; both types of organizations may pursue public recognition; and most of them have “altruistic” relations with the local communities that host them, even if hypocritical. Pablo Escobar, for example, is still remembered in Colombian communities for his huge generosity towards the poor. In fact, criminal bosses are only more or less accepted and even supported in those communities because they can develop strong social relations between the organization and the local population. During the tsunami in Japan in 2011, several first-aid convoys to help the victims of damaged zones were openly sponsored by a Yakuza faction, the Yamagushi-gumi. There is no need to argue that innovation and the crossing of jurisdictional boundaries are obviously also characteristics of organized crime. Another aspect that is interesting to explore is the eventual political goals. Academics mostly perceive the goals of organized crime to be exclusively monetary, not connected to any political or ideological beliefs. However, this is also not so easy to isolate. It is not difficult to find speeches by leaders of criminal organizations that invoke an ideological argument to support their existence, as Pablo Escobar Gaviria did in public speeches where he posed as a hero against the oppression of the Colombian government and American imperialism; some declarations by Yakuza bosses who perceive their initial mission as members of a group determined to “preserve the Japanese traditions against alien ideologies like communism and liberalism”; or motorcycle gangs who try to present themselves as groups that preserve the spirit of a “true American way of life”. Obviously, these are only “speeches”, and of course, everything is about money, and the ideological discourse is merely rhetoric to justify their criminal actions. However, the social and symbolic capital that they have among the local population cannot be totally ignored, especially because, despite controversies, the same logic could be applied to many political actors whose reasons for engaging in politics are unlikely to be limited to political beliefs alone. Moreover, it is not difficult to find sources describing histories of terrorists who joined some cause because of the money involved. In fact, even the notorious Cold War terrorist Carlos “the jackal was much more a private mercenary (or terrorist for hire) than necessarily someone driven by political ideology. Furthermore, the zone of behaviour where organized crime can be separated from terrorist organizations is not clear at all. Many historical examples can be easily found. Criminal groups can use terrorist tactics, such as Pablo Escobar, who blew up flight 203 from Avianca on 27 of November de 1989, killing 110 people; the attempted car bombing targeting the police chief of Macau by the Triad boss Wan Kuok-koi in 1998; the explosion that killed the Italian Judge Giovanni Falcone by the Italian Mafia in 1992; or the recent dismemberments and beheadings by Mexican cartels that are technically equivalent those carried out by the Islamic State in Syria and Iraq. However, even with such notorious cases, the Triads, the Cartels, the Mafia, etc. are not considered terrorist organizations, and their leadership is not hunted by drones equipped with Hellfire missiles as occurs with Al-Qaeda or the Islamic State. In addition, while terrorist organizations draw a huge part of their funds from ordinary criminal activities (Shelley 2015), an organized criminal organization is still considered a different actor than the terrorist organizations, even when both exhibit similar behaviours, structures, sources, and methodologies, and the only very weak and tiny line of differentiation between them is the supposed ideological or religious aim. In fact, some criminal organizations can be legitimately recognized and studied by government authorities such as the Minister of Public Security of China in 1993, Tao Siju, who said that “some Triad members were patriots and they should be respected if they upheld Hong Kong’s prosperity” (Lo 2010). Considering that every kind of actor may use terrorist tactics, and the structure of labelled terrorist groups may be technically the same as that of organized crime groups, the more accurate approach is still the one suggested by Khan (2003) in his view of aggrieved groups, because in the end, the only real difference between these two kinds of groups is the tolerance of the central authority towards its existence. In other words, if the government and such groups have no more interaction at all this group will be defined as a terrorist group. This interaction is a fundamental strategy of a criminal groups to sustain their survival; without its connections inside the governmental machine, through corruption and paternalism, the criminal group will eventually disappear or replaced by another. In fact, a very accurate and realistic way to understand terrorism would be by considering its t level of interaction with the state, rather than considering its behaviour alone. Criminal groups are outside the legal system but may still have some type of relationship and interaction with the government and the state. In fact, such groups do not want to break all ties with central authorities; Pablo Escobar, for example, tried to run as a politician. However, terrorism represents a radicalization in this relationship, in which there is no more interaction and a conniving coexistence is no longer possible. In this case, such marginalized or irregular groups will seek to drop out of the current political system and disengage from the groups that are controlling that system, or they may seek to separate geographically and claim independence over a territory by defying the central authority. Although non-governmental agents such as NGOs or private companies are not legally part of the government, they are at least covered by the state and its legal enforcement system because they are included within it. Organized crime operates outside of this legal system, but it is not radicalized enough to endanger the existence of the state, nor is it a direct threat to the political groups at the political core of the government. Thus, despite legal violations, their existence may be tolerated by some groups and authorities (especially corrupt ones), and that is why state forces will not use all of their power against them. In turn, terrorist groups, once they are defined as such, are the last sphere of existence. When the state or the political-governmental core sees itself as threatened by this group, the group is considered to be outside the legal system and are beyond the tolerance zone, i.e., terrorists. In general, it would be fair to assume that there are different layers of interaction between the different actors/groups and the national state government. The label of “terrorism” will be only applied by states concerned about specific non-governmental groups in a specific moment. In fact, even NGOs may be considered terrorist groups or a national security problem if the political groups at the core of the state decide that it is appropriate. In this case, it is worth noting the arrest of Greenpeace members after the attempt to board the Prirazlomnaya oil platform in Russia in 2013 (Walker 2013) and the banning of Greenpeace operations in India because of its “potential threat to the nation’s economy” (Greenpeace and other NGOs threat to nation’s economy, IB report warns, 2014). Another interesting case demonstrating how a criminal group can cross the edge of tolerance and be considered a terrorist group, is the case of the Southeast Asian group Abu Sayyaf. According to former FBI Agent Charles Regini and General Benjamin Magalong, this group is technically a criminal group concerned only with the profit from criminal business, rather than any ideological purpose (Blair 2016). In fact, for decades Abu Sayyaf has been considered a bandit group involved in kidnappings for ransom, weapon and drug smuggling, especially methamphetamine smuggling, with the support of local government officials in Sulu province (Alindogan 2016). It is fair to say the inclusion of this group in the “terrorist layer” occurred only because it broke ties with the central authority in an attempt to create a separate Islamic state for the Muslim minority in the region, endangering the territorial sovereignty of the Philippine national state. The opposite can also occur; for example, a group labelled a terrorist group may change its behaviour towards the central authority, becoming more docile while sustaining its criminal enterprises. More than simply escaping its terrorist label, this group can even turn into a useful tool for the political core of the government. This phenomenon may be observed in the Chechen scenario in relation to the Russian government. After their defeat in the First Chechen War, the Russian authorities learned important lessons about dealing with irregular groups backed by foreign powers. The Russians used the support of local actors, through an alliance with Kadyrov’s clan (which initially had supported the Chechen secession movement), to consolidate their authority in occupied territories and help to stabilize the region through the provision of money and the “loan” of governmental legitimacy (Yashin 2016). What was attempted to be explained here is the fact that labels such as terrorism, organized crime and others legal business simply reflect levels or layers of interactions between the political groups inside the core of the government with groups outside this governmental sphere. Interpreting the terrorist label by understanding the different levels of interaction and the function of the state may help to explain when such group will or will not be described as terrorist group rather than “just” a criminal organization. As the authors explained, the definition of terrorism as an action or tactic is fairly discussed and generally agreed upon. The problem remains in the definition of who is a terrorist, and the reason is that the definition and delimitations are merely symbolic, and the final decision will only be made by political interests. Moreover, many discussions around the conceptualization of terrorism seem to ignore the difference between state and government, which is fundamental to the understanding of when such label is or not applied in some cases. 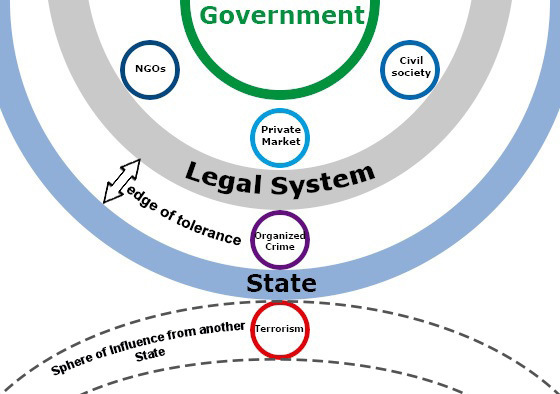 If the interactions of non-government actors with the state are defined in behavioural layers, levels or degrees, it is fair to assume that the first layer is composed by groups such as NGOs, social movements, private companies, etc., which are inside the legal system but outside the political core that controls the state (the government). The following layer would be criminal groups, which are outside the legal system but still covered by state gravity. These two layers are capable of directly and indirectly influencing the government; the legitimate actors through political pressure and the illegal groups through corruption or paternalism. As was previously noted, it is important to consider that criminal groups, despite their conflicts with governmental authorities, do not represent a major threat to national existence, and they may also have connections inside the government. The last layer, beyond state cover, would be the area where terrorist groups remain because, in this case, such groups are trying to cut all ties with the central authority, replace the groups inside the governmental core, or damage state sovereignty over a separatist territory. De Leon Pettais Professor at Rio Branco College and Researcher in the Political Geography Laboratory of University of São Paulo PhD in Human Geography from “University of São Paulo”, São Paulo, Brazil. Undergraduate in History from the “UniSant’Anna”, São Paulo, Brazil (2006), Graduate in Policy and International Relations from the “Foundation School of Sociology and Politics” São Paulo, Brazil (2008), and Master in Human Geography from the “University of São Paulo” São Paulo, Brazil (2012). Visitor Researcher in Virginia Commonwealth University (USA) and Honorary Researcher in The University of Hong Kong (China). Abadinsky, Howard. 2010. Organized Crime. Wadsworth, Cengage Learning. 9º Edition. Belmont: United States of America. Albanese, Jay S. 2007. Organized Crime in Our Times. 5º Edition. LexisNexis Group. Newark: United States of America. Albini, Joseph L; McIllwain, Jeffrey Scott. 2012. Deconstructing organized crime: An historical and theoretical study. McFarland & Company, Inc.
Alindogan, Jamela. 24 July 2016. Inside Abu Sayyaf: Blood, drugs and conspiracies. Al Jazeera. Available at: http://www.aljazeera.com/news/2016/07/abu-sayyaf-blood-drugs-conspiracies-160724090604857.html (accessed February 2017). Blair, Sam. December 2016. Captive, “American Missionaries, Philippines”. Documentary. Netflix Studios,LLC. Dedeogu, Beril. 2003. Bermuda triangle: Comparing official definitions of terrorist activity. Terrorism and Political Violence. 15:3, 91-110. Duggan, Christopher. 1989. Fascism and the Mafia. New Haven: Yale University Press. Financial Action Task Force (FATF). February 2015. Financing of the Terrorist Organisation Islamic State in Iraq and the Levant (ISIL). http://www.fatf-gafi.org/media/fatf/documents/reports/Financing-of-the-terrorist-organisation-ISIL.pdf (accessed February 2017). Freilich, Joshua D.; Chermak, Steven M.; Simone Jr, Joseph. 2009. Surveying American State Police Agencies About Terrorism Threats, Terrorism Sources, and Terrorism Definitions. Terrorism and Political Violence, 21:3, 450-475. Khan, Ali. A Theory of International Terrorism. 1987. Connecticut Law Review, Vol. 19. p. 945. Available at: http://papers.ssrn.com/sol3/papers.cfm?abstract_id=935347 (accessed January 2017). Lo, T. Wing. 2010. Beyond Social Capital. Triad Organized Crime in Hong Kong and China. British Journal of Criminology, 50. Meisels, Tamar. 2009. Defining terrorism – a typology. Critical Review of International Social and Political Philosophy. 12:3, 331-351. Ramsay, Gilbert. 2015. Why terrorism can, but should not be defined. Critical Studies on Terrorism. Vol. 8, Issue 2. Romaniecki, Leon. 1974. The Soviet Union and international terrorism. Soviet Studies. 26:3, 417-440. Shelley, Louise I. 6 January 2015. Islamic State Is a Diversified Criminal Operation. Interview to Der Spiegel conducted by Dettmer, Markus and Schindler, Jörg. http://www.spiegel.de/international/business/terror-expert-shelley-speaks-of-islamic-state-business-model-a-1011492.html (accessed January 2017). The Times of India. 11 June 2014. Greenpeace and other NGOs threat to nation’s economy, IB report warns. Available at: http://timesofindia.indiatimes.com/india/Greenpeace-and-other-NGOs-threat-to-nations-economy-IB-report-warns/articleshow/36400491.cms (accessed February 2017). Walker, Shaun. 20 September 2013. Greenpeace activists could be charged with terrorism after ship stormed. In The Guardian. Available at: https://www.theguardian.com/environment/2013/sep/20/greenpeace-ship-stormed-russian-coastguard (accessed February 2017). Zanchetta, Barbara. 2016. Between Cold War imperatives and state sponsored terrorism: The United States and “Operation Condor”. Studies in Conflict &Terrorism, Volume 39, Issue 12. Not described by Zanchetta, but worth consideration, is the failed car bomb in Rio de Janeiro, Brazil, known as the “Attempt of Riocentro”. This was a failed “false-flag” attack by the Brazilian government to explode a car bomb during a public event and accuse leftist groups of the attack; however, the car exploded with the two officials already inside the car.